Each morning we awake to the sound of a flute played from the hilltop. For those who wish, there is time for a refreshing dip in the mist-covered lake. Meals are enjoyed on open porches by the lakeshore with food served family style, warm and fresh, from the kitchen. Table groups consist of girls and boys of mixed ages and two counselors, all of whom share in the mealtime responsibilities. After breakfast, each tent group neatens their tent and then helps out with jobs around main camp - from splitting wood for the kitchen stove to tending the garden to preparing the rowboats for the day. These duties foster a sense of communal responsibility, fun, and satisfaction in a job well done. Next, we meet under a canopy of spruce and balsam trees to sing and plan activities. The assembly is also a time for campers to share any recent nature observations with the group. Morning and afternoon activity times combine our core and optional activities. For the first two weeks, campers focus on developing their boating and swimming skills and learn to safely use a jackknife. 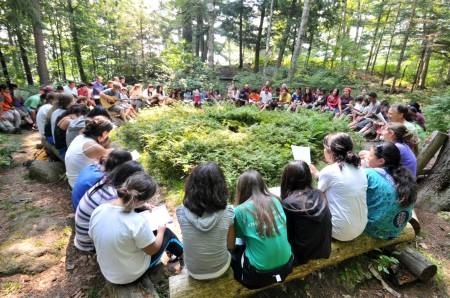 After two weeks, campers and staff together decide on their projects and activities. 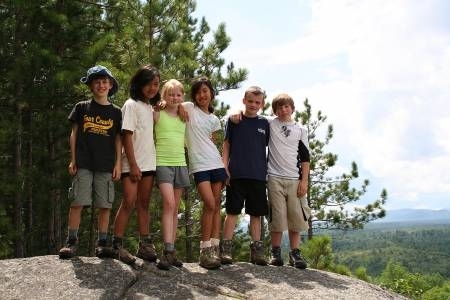 Our nearly 2:1 camper to staff ratio allows us to tailor the program to meet the interests and needs of individual campers as well as the group as a whole. Our swim program is based on Red Cross requirements with an emphasis on improving form and stamina. As with our other activities, the swim groups are small with two instructors teaching four or five campers. We have our main meal at midday. The home-style meals are varied, nutritious, and satisfying to active, growing children. 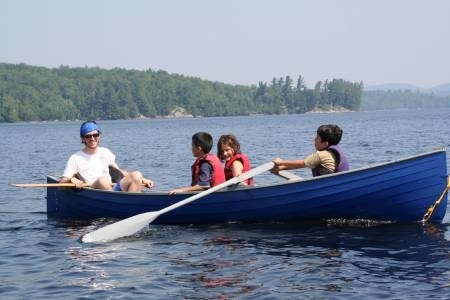 Both campers and staff enjoy the rest time that is followed by afternoon activities, then a swim or game. After supper there is another game or group activity. Some children prefer less structured time before and after supper to read, play a musical instrument, or share a game with a friend. 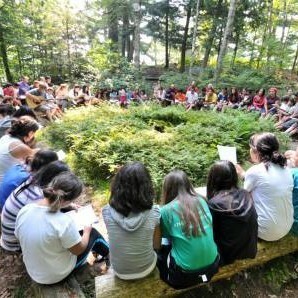 A fireside story at their tent with their counselor completes the campers’ day before the flute sounds taps. Each day at Tanager Lodge is slightly different from the one before. Throughout the six weeks, we introduce activities that comfortably challenge the campers’ steadily improving skills and develop and sustain new interests.